Lake Kivu is known as the Best Place to relax and chill out in Rwanda. After all the adventurous and tiring activities such as gorilla trekking, golden monkey tracking and hiking, you need a place to relax and wind down and lake Kivu is just the perfect place for that. There is no better place to visit as you end your safari trip in Rwanda. Here you can swim, lounge on the sandy beaches and simply enjoy yourself in the scenic and serene environment. Lake Kivu is just the perfect place to just be instead of doing, the relax, read a book, enjoy the tropical sun, the splendid views of the Lake, the Islands, the Mountains, fishing boats, the smell of the water and the light breeze. If you are not so exhausted from other activities you can still take in a nature walk, go birding either by boat, or on land, explore some of the islands the nearby hot springs and so much more. There is a variety of hotels to enjoy from budget to exclusive up-market lodges and hotels. The choice is yours according to what your pocket-book will allow you to spend. What are some of the things you can enjoy while relaxing in and around Lake Kivu? There are many beautiful lakes in East and Central Africa but you cannot swim in most of them. Lake Kivu is not only a lake where you can relax and chill out, but you can swim in the Lake. There are no hippos, crocodiles and no Bilharzia found in Lake Kivu making it the perfect natural swim hole. The temperature at the Lake is just right and the water is not too cold. It is just perfect to dive in get refreshed. If you prefer to swim in a pool, there are hotels and lodges in the area that have swimming pools. So you will still get you swimming opportunity and relax. 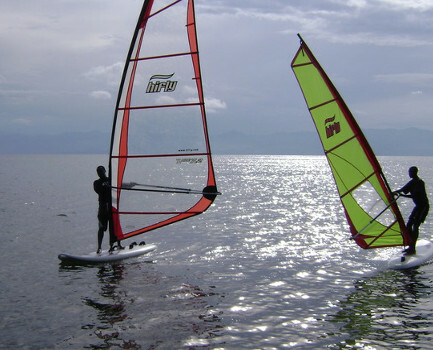 There is a variety of water sports to enjoy in Lake Kivu. You can go sailing, kayaking, motor boat riding, fishing, wind surfing, water-skiing and more. Lake Kivu is known in Rwanda and with past visitors as a place for excellent water-sport activities and Lake Kivu does not disappoint. You can even go fishing for some tilapia for lunch or dinner – another relaxing and enjoyable way to enjoy Lake Kivu. 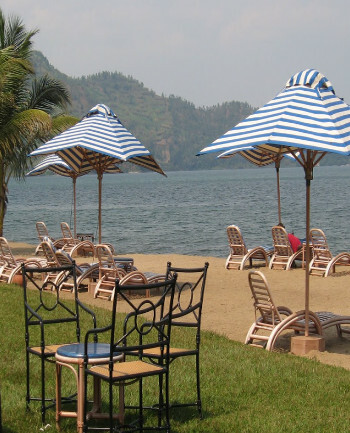 At Lake Kivu you can enjoy half day, or full day hikes and nature walks and bike rides. You can go hiking or biking for one day or several days on the newly developed Nile-Congo trail. As you hike and bike, bike you can also go on village visits and do some cultural tourism and interact with the locals and learn a bit about them. You can also climb up some hills and back down on your bike. Rwanda is after all the land of a thousand hills, it is inevitable that there are hill near Lake Kivu. If you are a coffee lover, you can take the opportunity to enjoy a coffee Tour on your visit to Lake kivu.. The half day excursion includes a boat ride on Lake Kivu to Nyamirundi Island where you learn and take part in the coffee making process from crop to cup. Many major coffee houses across the world including Starbucks are using Rwandan Arabica Bean Specialty Coffee. Imbabazi Orphanage was started Rosamond Carr who lived in the Mugongo area for many years . it is here that she started a flower plantation that supplied hotels with fresh flowers from Kigali. She was reportedly a very close friend of Diane Fossey. In 1994 she began the Imbabazi Orphanage which moved several times due to the insecurity brot about by the genocide but as security was restored to the area, the orphanage was moved back to the Gisenyi Area. Rosamond Carr died in 2006 but her memory lives on through the flower farms and the Imbabazi Foundation’s work with children. You can stroll through the English Garden, enjoy views of the Volcanoes, learn about Rosamond Carr’s life and her friendship with Diane Fossey, enjoy lunch and be entertained by the Imbabazi Dancers. It is such a delightful experience. 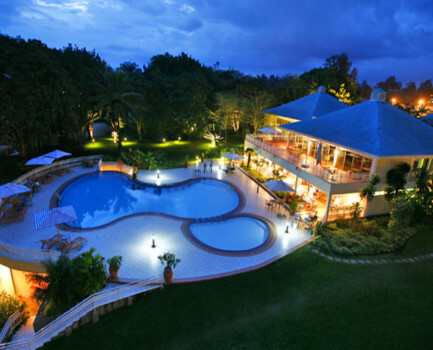 For accomodation, there are many beuatiful and comfortable hotels around lake Kivu for differnt budgets. there are up market ones and moderate ones. There are many things to do and see at Lake Kivu and surrounding area. The above are just a few of them. Do add Lake Kivu to your itinerary and you will discover the rest of the exciting things it has to offer.